Recently discovered rubies from Winza in central Tanzania have gained popularity for their bright red colour and transparency (Gems & Gemology, Summer 2008 Gem News International, pp. 177–179). 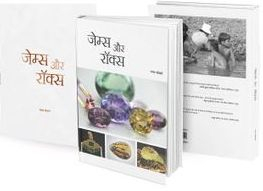 Sapphires have also been reported from this deposit (V. Pardieu and D. Schwarz, “Field report from Winza,” Rapaport, Vol. 31, No. 26, 2008, pp. 173–175), but they have not received as much attention. At the Gem Testing Laboratory in Jaipur, I had an opportunity to characterize a 0.56 g sapphire crystal (figure 1) that was brought to attention by Shyamala Fernandes of Jaipur. She obtained the crystal from Jacob Hoyer of Italy, who purchased it directly from a Winza miner. The crystal’s appearance immediately pointed to sapphire due to its characteristic pyramidal habit, which was terminated by a pinacoidal face; it also exhibited faint horizontal striations along the pyramidal faces, in addition to tiny hexagonal to sub-hexagonal growth hillocks (figure 2) on the pinacoid that were observed only at high magnification. The most interesting feature of the crystal was its colour zoning. The area nearest the pinacoid was purple-pink, which gradually shifted to colourless and then blue (again, see figure 1). 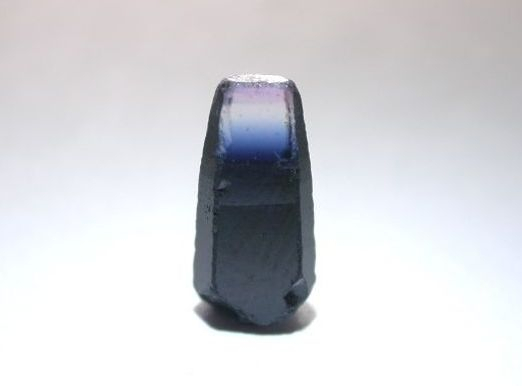 The latter colour increased from light to deep blue to almost black toward the lower end of the crystal, making it appear opaque. When magnified, this colour distribution seemed to be restricted to zones with sharp edges that mostly followed the pyramidal directions within the crystal (figure 3, top and centre). In addition, the purple-pink area displayed zones of alternating saturation along with some blue zones that were oriented parallel to the pinacoidal face (figure 3, bottom, also illustrated in M. S. Krzemnicki and H. A. Hänni, “New Tanzania mine uncovers source of exceptional rubies,” InColour, Spring 2008, pp. 46–47). 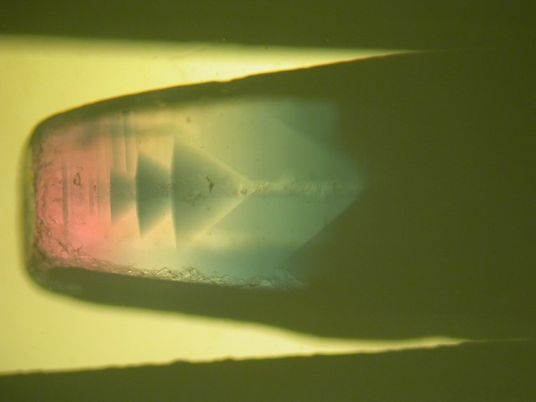 Figure 3: The colour distribution of the sapphire appeared to be restricted to zones with sharp edges that followed pyramidal directions within the crystal (top and centre). The purple-pink areas also displayed alternating zones of lower and higher saturation along with some blue bands (bottom). Magnified 35x (top), 45x (centre), and 60x (bottom). 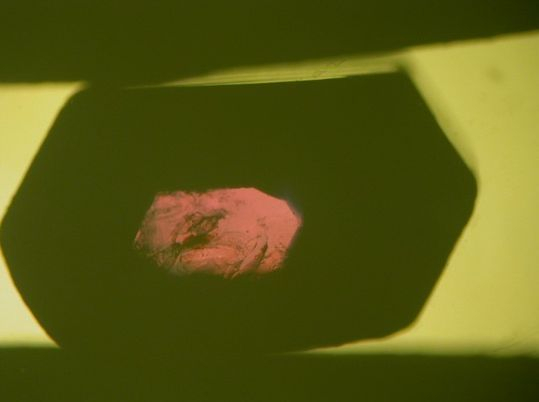 When the crystal was viewed along the c-axis, we observed a transparent purple-pink core that was surrounded by a dark blue to black rim (figure 4). This effect reminded us of Mong Hsu rubies where the central core is dark blue and the outer rim red; in this crystal, the zoning was reversed. However, we could not determine whether this core was colourless and the purple-pink colour visible because of the zone at the tip of the crystal, or if the core itself was purple-pink. 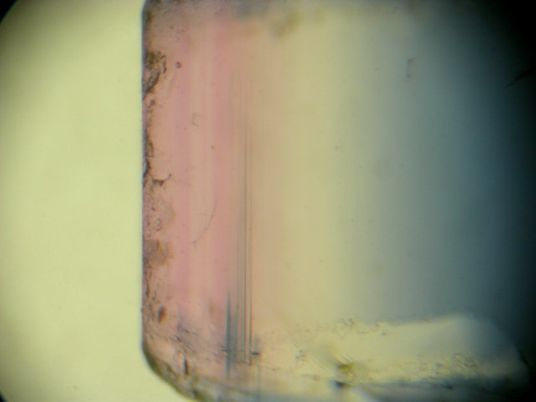 No mineral or fluid inclusions were seen due to the dark colour of most of the crystal; only the colour zones described above were seen where it was relatively transparent. Since its discovery, the Winza deposit has produced some fine rubies, along with interesting specimens such as this sapphire. With further exploration, a wider range of material may be expected.